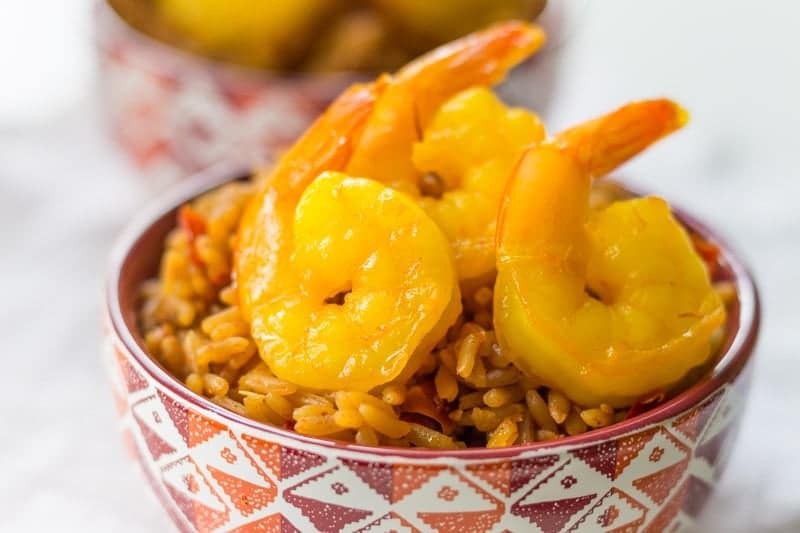 This saffron shrimp recipe was sponsored by Veetee Rice. All opinions are my own. Saffron is an amazing spice. It takes only a few threads to flavor foods with its unique aroma and color. If you’ve never cooked with saffron before, check out the saffron below tips to help you get started! This sauteed saffron shrimp recipe is perfect for a fast dinner. Shrimp cook lightning fast, which means that you can have dinner on the table within minutes. It’s easy to scale this recipe up or down to serve 2, 4, or even eight people. 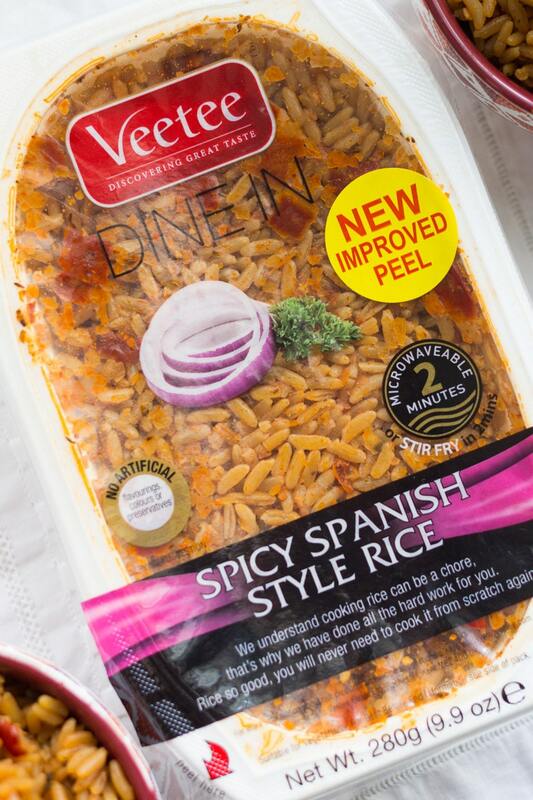 I’m pairing the saffron shrimp with one of my favorite rice products, Veetee Spicy Spanish Style Rice. 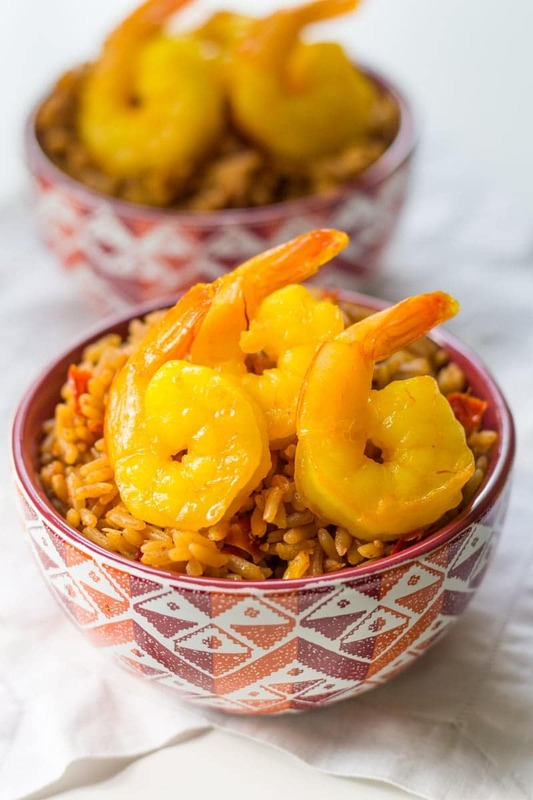 Rather than wait for a pot of rice to cook, you can have this aromatic rice ready as fast as you can cook your shrimp. It only takes 2 minutes in the microwave or skillet. 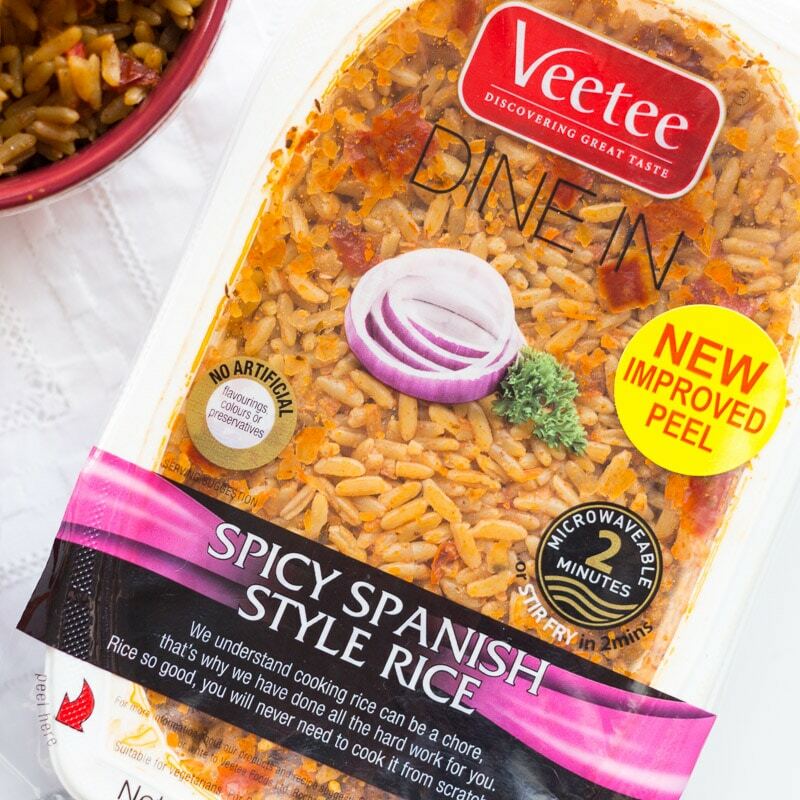 What I like about Veetee Rice is that not only is it a great convenience and time-saver, but it tastes as good or better than rice cooked from scratch. I’ve used it to make dinner bowls like this one as well as desserts, like this Honey Coconut Lime Jasmine Rice Pudding using Veetee Jasmine Rice. You can find Veetee Rice in the rice aisle of your favorite grocery store! Spend the extra dollars, if you can, to buy high quality saffron. Sometimes, inexpensive “saffron” is not saffron at all, or is a poor quality type of saffron. Soaking the saffron threads overnight brings out the flavor. If you forget to soak them overnight, go ahead and soak them for a shorter time so that you get as much flavor as possible. Don’t go overboard. Although it may be tempting to add more saffron, keep in mind that it’s quite potent. A few threads are generally sufficient. Saffron works well in both savory and sweet dishes, so feel free to experiment with saffron in all sorts of recipes. Sauteed saffron shrimp are a beautiful yellow color with a delectable flavor. Ready in just minutes with a simple white wine and saffron marinade! Soak the saffron threads in the white wine at room temperature overnight. Toss the shrimp with the white wine, saffron, and olive oil. Set aside while you preheat a large nonstick skillet to medium heat. It's hot enough when few drops of water dropped in the pan immediately hiss into steam. Check out all the varieties of Veetee Rice! Oh wow, this sounds phenomenal! I have never had shrimp prepared this way before and can’t wait to try it. This looks delicious and so easy to make. I am going to be looking for this the next time I go to the store. Thanks for the heads up! I’ve never cooked with Saffron. I hear it’s a great ingredient, but have never even tried it. May have to try this recipe though! Saffron shrimp sound like a meal I could really enjoy. Love the rice that you chose to go along with it. I’ve always wanted to cook with saffron but never have. This is the perfect recipe to try it out. I love shrimp and I know my family will enjoy this recipe. I love any and all shrimp dishes. This one sounds like it has a lot of flavor, which is perfect. I love shrimp dishes. This saffron shrimp sounds like such a delicious dinner for any day of the week. I can’t wait to try this recipe this weekend. For some reason I always think I don’t have time to make shrimp but there is nothing time consuming about it. This meal looks delicious and I love how convenient it is. It’s incredible to see what saffron can do to the color of food! This shrimp looks oh-so delicious! I just love Saffron, but is is something I never personally cook with. Will check out Veetee’s selection at the store. This looks delicious! Saffron is one of my favorite spices to use. 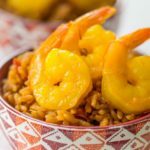 It sounds perfect to go with the Spanish rice! This looks so good! I love shrimp and I want to make this recipe. Yumm.. Sauteed Saffron Shrimp sounds delicious! I would love to try out this recipe. Plive oil is not mentioned in the ingredient list but it IS mentioned in the directions. How much olive oil? Hi Diane! Thanks for spotting that. I’ve updated the recipe just now to show 2 tablespoons of olive oil. It’s flexible, so you can use a little more or less if you need to.